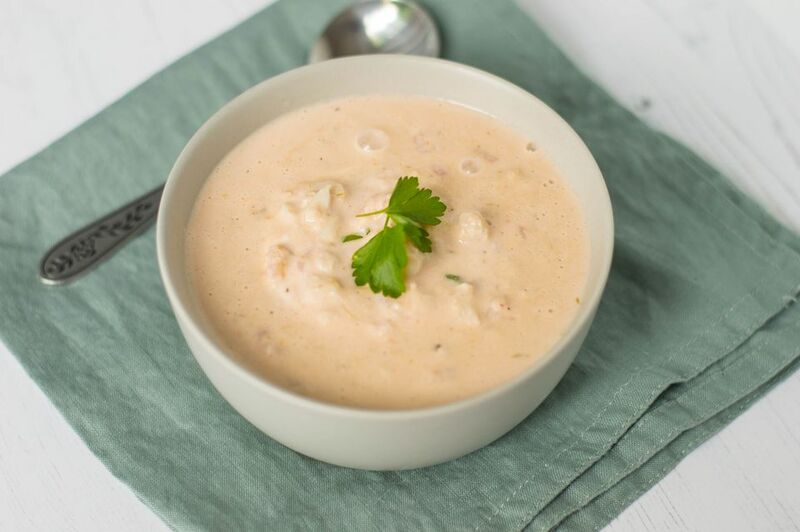 If you're a purist, you know that a true bisque is a seafood soup, but it is often used to describe any creamy soup. The soup is French, but the origin of the word "bisque" it is not clear. It might be derived from Biscay, as in The Bay of Biscay, a gulf which lies off the west coast of Europe, bordering Western France and Northern Spain. The soup is super easy to prepare and cook, and it's ready in 15 minutes. Serve with freshly baked biscuits or crusty bread. If it's a lunch or main course soup, add a salad. Melt the butter in a Dutch oven or large saucepan over medium-low heat; add the chopped green onion and celery. sauté, stirring, until tender. Blend the flour into the butter and vegetables until well incorporated. Continue cooking, stirring, for about 2 minutes. Warm the milk in another saucepan over medium heat. Slowly stir in the warmed milk and continue cooking and stirring until thickened. Add the freshly ground black pepper, tomato paste, and heavy cream. If desired, puree the soup in a blender or food processor (see the tips) at this point and then return it to the saucepan. Stir in the crab, shrimp, and the sherry. Bring to a simmer. Sherry is a wine which is fortified with brandy. Dry sherry is a good choice for this recipe. After sherry is opened, it should be stored in the refrigerator. When you puree hot soup, don't fill the blender more than half full. If too full, the pressure from the steam can cause an explosion, forcing the top off of the blender. To avoid that, puree any hot liquids in small batches, and hold the blender cover on with a folded kitchen towel in hand. Feel free to add small cooked bay scallops or lobster instead of the shrimp. Replace the green onions with finely chopped shallots. If desired, garnish the soup with thinly sliced green onion tops, cilantro, or parsley. Or add a spoonful of sour cream and swirl it.